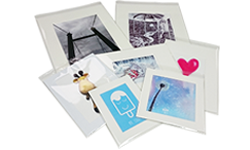 Greetings or Postcards and Archival Giclée Prints and provide an easy way to expand your product range. are a fuss-free ready-to-go option suitable for the gift market, selling at craft fairs, art markets or in shops. both ideal for artists and photographers. The prices shown are for the minimum order of 10 Gesso Prints (apart from the sample) and include VAT. Further quantities and prices can be found by clicking the 'More Information' button.